As tiny-handed man-children command the lion’s share of our nation’s attention, the still-acting leader of the United States—President Obama—is quietly doubling down on climate change. The latest part of Captain Planet’s scheme? Getting Canada on board. After years of taking a backseat on climate change, the US and Canada are trying to position themselves as leaders and allies on the issue. Today, Canadian Prime Minister Justin Trudeau is visiting the White House to talk energy and climate with Obama. In advance of their meeting, the two countries have announced a sweeping new set of pledges to curb greenhouse gas pollution and safeguard our environment. “The climate relationship with Canada really just ramped up dramatically quickly,” Obama’s climate envoy Todd Stern told the New York Times this morning. A major aspect of Obama and Trudeau’s joint strategy is a pledge to regulate methane emissions—a topic which received a national spotlight several months back, when a massive natural gas storage well near Los Angeles ruptured, spewing 97,000 tons of methane into our atmosphere. Although our energy sector emits much less methane than CO2, methane packs 84 times the global warming punch over the short term. And the recent LA gas leak was just an egregious example of a ubiquitous problem: we’re doing a piss-poor job ensuring that this heat-trapping gas stays in the ground. Nationwide, there are approximately 400 natural gas storage facilities that, like the leaky one at Aliso Canyon, are subject to little or no federal regulation. Facilities that might also be pumping methane through 50 year old well pipes without safety valves. Now, for the first time, the EPA and Environment and Climate Change Canada are both being tasked with developing regulations for methane emissions from new and existing oil and gas sources. The announcement dovetails with the Obama administration’s recent commitment to cut industrial methane emissions by 40 to 45 percent by 2025—and signals that Canada may be on board to do the same. The two leaders also announced a new partnership focused on protecting Arctic communities on the front lines of climate change. Arctic climate change is another area that’s received special attention from Obama of late: last summer, the president made a historic trip to Alaska with his selfie stick to shed a spotlight on melting permafrost and rising sea levels. 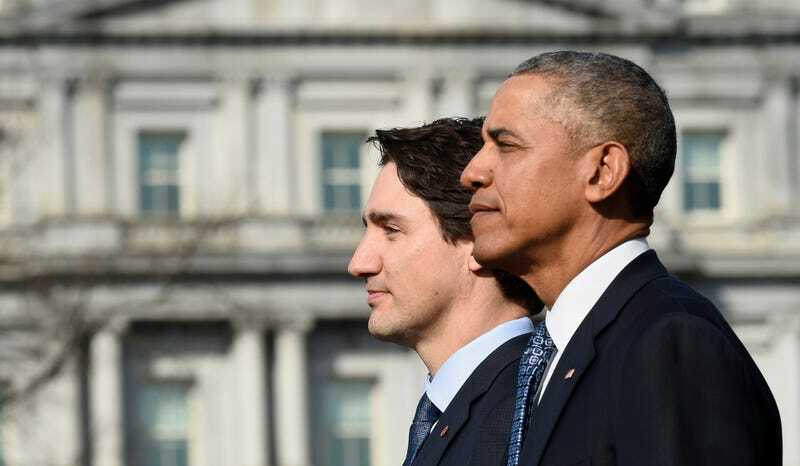 Finally, Obama and Trudeau have jointly agreed to ratify the Paris Climate Agreement—an international accord to bring carbon pollution down to zero by the end of the century—as soon as possible. Before it can be enshrined into international law, the Paris agreement must be ratified by nations representing 55 percent of global carbon emissions. Signatures from both the US and Canada would go a long way toward meeting that requirement. But perhaps the most significant aspect of Obama and Trudeau’s climate and energy tête-à-tête is a symbolic one. Over the past year, Obama has been trying to make up for a quarter century of failed US leadership on climate change, by tackling the problem on as many fronts as possible. While some of his more radical ideas—like an oil tax and banning coal development on federal lands—may be dead on arrival in Congress, he’s laying a foundation that other environmentally-oriented leaders can pick up on. And in Trudeau, Obama might have just found a somebody to pass the torch off to.